Solus Christus: The Apostle Peter declared that "... there is salvation in no one else; for there is no other name under heaven that has been given among men by which we must be saved." Acts 4:12. Not any of the works, the philosophies or religions of men can offer any measure of hope for salvation, for the Lord Jesus Christ declared: "I am the way, and the truth, and the life; no man comes to the Father but through Me." John 17:4. 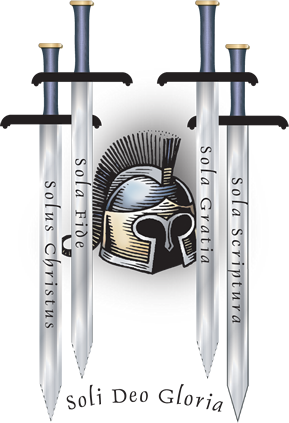 Sola Gratia: By God's grace alone sinners receive the gift of eternal life through faith in Jesus Christ; not because of any of their deeds, social affiliations or genealogy. Because salvation is the sovereign gift of God, the redeemed have only one object of boasting: The Lord God - " But by His doing you are in Christ Jesus, who became to us wisdom from God, and righteousness and sanctification, and redemption, so that, just as it is written, "Let him who boasts, boast in the Lord." 1 Corinthians 1:30-31.